Yesterday’s blog mentioned that geoarchaeologists Charles Frederick and Ken Lawrence would be with us in the field today. For an archaeologist it is often a humbling experience to have a geoarch look at the same dirt you have been digging through and staring at for days—the things they see that we don’t! They have both archaeological and geological training and whereas we ‘pure’ archaeologists look for cultural layers and cultural things, they look first at the natural formation processes. How and when did the layers form, and how were they transformed since being created by the hand of man and the myriad vectors of ‘bioturbation’? This may seem easy enough to decipher with a simple layer-cake stratigraphic profile, but what we have in the rockshelters of Eagle Nest Canyon is anything but simple—convoluted layers chopped up and partially blended by burrowing animals, insects, and the pits, fires, and scratching around that peoples ancient and historic have done. Let’s introduce our collaborators of the geoarchaeological persuasion. Dr. Charles Frederick is regarded by most as the preeminent geoarchaeologist working in Texas today and arguably one of the best in the world. He earned his Ph.D. at UT-Austin under the famed geographer Karl Butzer and he has worked all across Texas and many other places in the world. Charles taught in the University of Sheffield in the UK, but returned to Texas where he is an independent consultant who works as a subcontractor for many different firms and organizations. What sets him apart is his encyclopedic knowledge of geology, pedology (study of soils), and natural science in general. That and the way he approaches any research project—with an open, critical mind and the belief that something useful can be learned if you pose the right questions and link the big picture to the nitty gritty details. Charles is a true scientist, he forms hypotheses (trial explanations) and then he tries to test them by seeking the hard evidence that could either disprove or strengthen the notion. His comrade in arms on this trip is Ken Lawrence. Ken earned his M.A. at Texas State University where he studied under geoarchaeologist Dr. Britt Bousman. He works for SWCA an Austin environmental consulting firm. But like Charles he is here volunteering his time to help us because he likes the challenge of working in an area where few geoarchs have ventured. The chance to do pure research unfettered by regulation and the bottom line. Ken, too, appreciates the opportunity to be able to spend time in the field with Frederick. Geoarchaeologists often find it a bit frustrating to work with the unwashed (archaeologists who lack geological training) because we speak different lingo and we don’t look at the dirt through the same lens. Watching the two of them bounce ideas and observations off one another is quite educational. Their mission for the next several days is twofold. First and foremost is helping Dan Rodriguez, the Texas State graduate student who is studying Kelley Cave and adjacent Skiles Shelter for his Master’s thesis. Last week Dan and fellow grad students finished digging a 1-x-2m unit in Kelley, or at least he took it as deep as they could practically (and safely) go – a bit over 7 feet deep. When the digging was done, Dan carefully cleaned several of the profiles (walls) and took many overlapping detailed photographs using LED light panels to illuminate the dark confines. This week Black cleaned up the walls a bit more and sprayed them down with a fine mist. Dan’s dry photos show some things well, but wetting the walls makes many subtle and obvious details ‘pop out.’ So we took another round of several hundred overlapping LED-lit close-up photos and through computer magic stitched these together to form geo-referenced mosaic and 3D model using the Structure from Motion (SfM) approach pioneered by our collaborator and archaeo-geek extraordinaire Mark Willis. But we’ll tell more about Mark and SfM in future posts. Today Frederick, Lawrence, and Rodriguez spent all day in and out of the Kelley Cave excavation unit, carefully and minutely examining the stratigraphy (layering) and spotting details neither the photos nor our archaeological eyes had seen. Ken and Charles took turns in the hole, each annotating the printed photomosaics with their take on the layers. 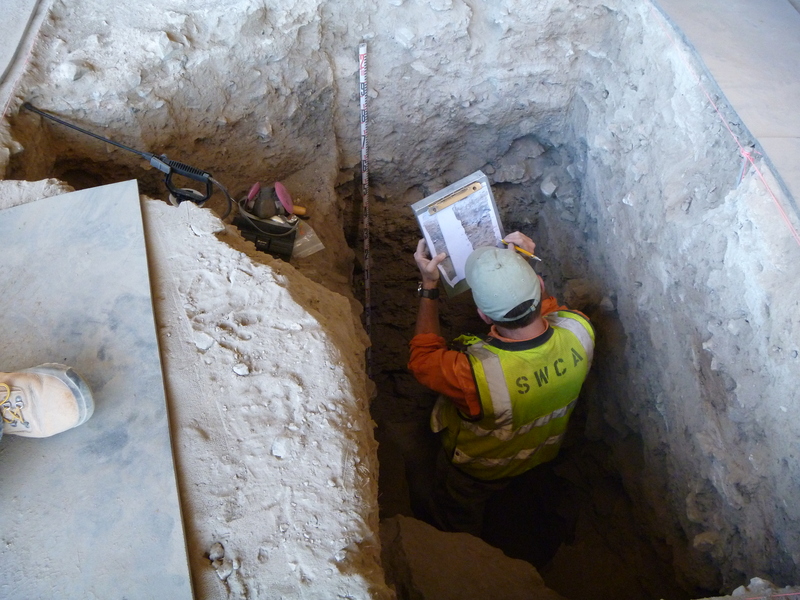 Dan watched from above and annotated his own set, asking questions and trying to put the geoarch’s observations and explanations in the context of what his excavations had encountered. And we haven’t even mentioned the sampling. Ken Lawrence annotating the stratigraphic layers present in the profile. We should explain that one of us was also present and madly taking notes. I (Jake) have been tasked by Dr. B (Steve) to make myself useful to the geoarchaeologists, now and as the project unfolds. My minor at Texas State was Geology, so I have an inkling of what they are doing. Both Charles and Ken expressed that the Kelley profile is as complicated and messy a profile as they have ever seen. Their goal is to take as many samples as possible to try and deconstruct how all the sediment came to be in the shelter. According to Charles, the sediment could be alluvium from the Rio Grande, alluvium from Mile Canyon, soil from above the shelter on the canyon rim, and possibly even from swallow and mud dauber nests. 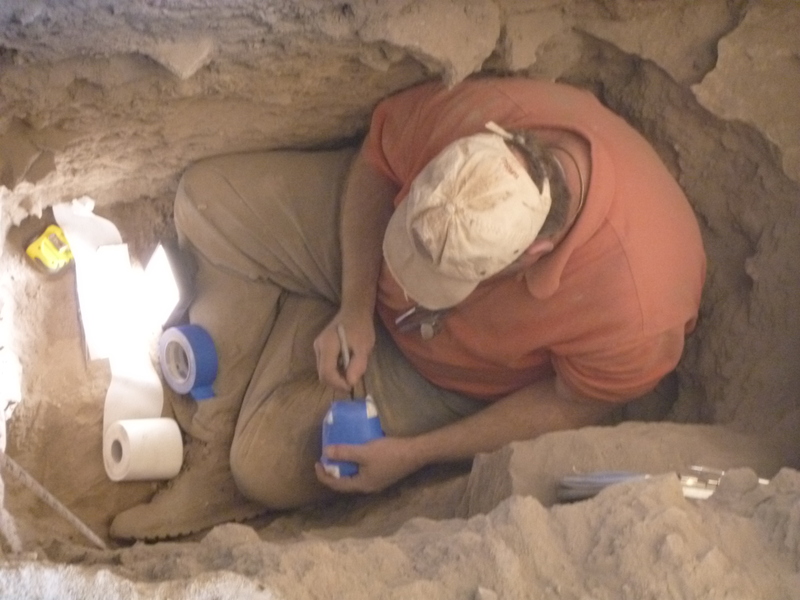 Ken began by taking samples from within the north profile’s different stratigraphic layers. Using a trowel he dug as far into the layers as he needed to fill the quart sized sample bags. Once Ken was finished Charles took several micromorphology samples called micromorph blocks. The blocks are handled with the utmost care, wrapped in toilet paper and tape to help maintain their structure. These intact cubes of sediment can later be impregnated with plastic, and once impregnated they can be shaved into thin sections for microscopic analysis. Ken and Charles hope to piece together the jigsaw puzzle of depositional processes within the rockshelter by analyzing the dirt’s composition. Today was the first step towards that end. Dr. Charles Frederick packaging a micromorph block. Above we said that the geoarchaeological mission was twofold. Part two is the big picture: how did the deposits within Eagle Nest Canyon form and transform over time and how did the landscape itself form and weather the passage of time? OK, threefold: Charles and Ken are also here to help us strategize how we will investigate Eagle Cave, the biggest of the canyon’s rockshelters, over the next few months. We have formed our basic research plan, but they will help us figure out how we can maximize the amount of data we can collect as we document and sample the rockshelter’s discontinuous stratigraphic profiles. Data that will speak to the big picture and inform us as to the nitty gritty. Stretching before our research eyes are many forms of dirt by other names. Fascinating! Best wishes on all of this. Exciting stuff! I look forward to future updates on the geoarchaeology and learning about the SfM. Looks like fun, lucky to have Charles F working on the site. Have worked with Charles on several projects, always learned a lot. Wish I was there, looks like a wonderful archeological site in west Texas.